It still feels like yesterday when we would tune into an Indian channel and see people gyrating to lungi dance courtesy Shah Rukh Khan and Deepika Padukone. But imagine taking a stroll across the streets of London wearing a lungi as a fashionable skirt. Zara are known for selling clothes that are a hit among fashionistas. But they are causing quite a chuckle after trying to sell a lungi, available from £3, as a fashion garment for women at £70. 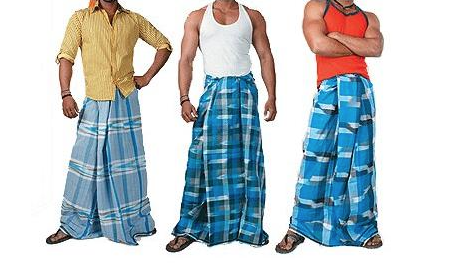 The lungi is considered as a heat-appropriate clothing in countries such as India, Pakistan, Bangladesh and Nepal, and is wrapped like a sarong. Zara is selling their brown checked “flowing skirt with draped detail in the front, slit detail at the hem. Zip fastening in the back hidden along the seam” for £69.99. However, if you were to buy the item of clothing elsewhere, you could be saving yourself from digging a whole in your pocket by buying a lungi for £3, and that too in many varieties. For example, a website called Lungi Wala, the sarong-type clothing is being offered for ₹346. You can find the lungi being sold on other websites for much cheaper as well. Although the popularity of lungi seems to have declined over the years, it still remains a go-to clothing in the hotter parts of the world. And with Bollywood celebrities adoring the lungi in their films, as well as models showcasing it during catwalk shows, who knows its popularity may escalate again in the near future.